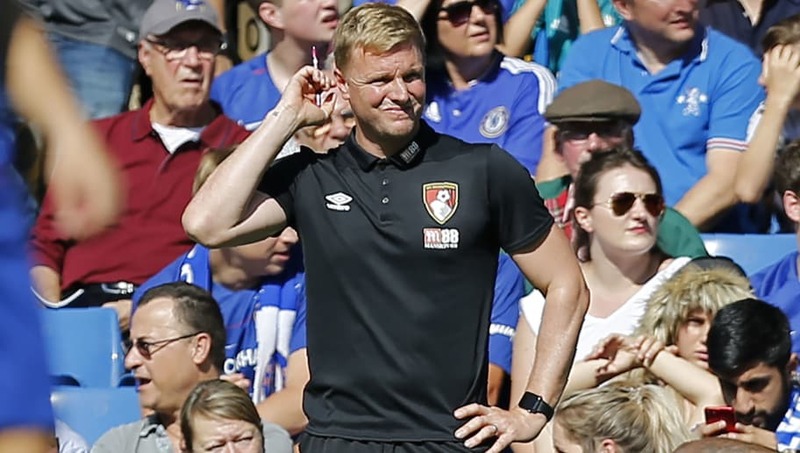 ​Bournemouth manager Eddie Howe has praised his team's overall performance, despite the Cherries struggling to create chances as his team fell 2-0 to ​Chelsea. Both sides came into the match undefeated, but ​Chelsea were comfortable favourites ahead of kick off. Bournemouth thoroughly frustrated Chelsea's attackers, but ultimately fell to goals from Pedro and Eden Hazard. Howe was asked for his thoughts on the game by the ​BBC, and responded: "We felt we were well in the game today. Defensively, I thought we were really strong up until the first goal, which was a cruel deflection. "We had the best chances in the game, with Callum [Wilson]'s chance and Nathan [Ake]'s chance, they're big moments in a match like this. "I think we're pleased to create the openings. They were good ones for us - one on the counter attack and one from a set piece. I thought, although we didn't have a lot of the ball today, we did pose them problems with our pace up front. "Overall, the team performance, I thought, was pretty good. Even at 2-0 down, we're still trying to create and get back in the match so, mentally, a good performance from the players. "Disappointed with the second goal because I felt, even at 1-0, we were well in the match. I expected us to produce some late pressure on their goal. The second goal sort of kills that opportunity. "But I thought we saw some good signs for the future. Chelsea's going to be a really tough opponent for everybody this season, I think they're going to go very close this year so, although we're disappointed with the result, we're heartened by the performance." Despite losing their undefeated streak in the ​Premier League, ​Bournemouth will be incredibly happy with their displays so far. They now have two weeks to prepare for ​Leicester City, and will be hoping to bounce back with a positive display.